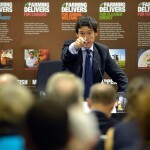 Rory initiated an Adjournment Debate in the House of Commons last Wednesday at which he led MPs from around the country to push the Minister for Broadband, Edward Vaizey MP, on the demand for rural broadband. In the Westminster Hall Debate on Wednesday 23rd March 2011 Rory attracted 20 fellow MPs to the debate representing constituencies as far reaching as Airdrie and Shotts, Newcastle upon Tyne, Carmarthen, Herefordshire, East Yorkshire, Suffolk, Norfolk, Gloucestershire, Devon, Lincolnshire, Northumberland and Lancashire. In response to Rory’s speech the Minister for Broadband commented upon the vast representation of MPs saying “No one can doubt rural communities’ desire to achieve broadband roll-out.” He also praised Rory’s leadership on this issue and confirmed that the £530 million the government has put aside to help fund broadband roll-out would be specifically for places where the market will not deliver – mainly rural communities. You can watch the debate online here – fast forward to just after 16:00. This is a fantastic budget for Penrith and the Border. Our economy depends on four things: small and medium sized businesses (which prop up our incredible tourism industry), fuel prices (because of our long distances), infrastructure (such as broadband) and agriculture. We’ve made huge progress on broadband and, following the visit of the Defra Ministers last week, on support for our farming. The Budget gives us the final elements of support to small businesses and fuel. Penrith and the Border has almost the highest concentration of small businesses of anywhere in the country: 92% of our businesses employ less than 10 people. The Chancellor promised today that businesses employing less than 10 people will face no new regulations for three years. He has also doubled the capital investment allowance (which is very important for our medium-sized manufacturers) and will cut corporation tax by 2% this year and 1% in each subsequent year. I have spent much of the last few weeks lobbying the Treasury and the Chancellor to drop fuel duty and I am delighted that he has responded with a 1% cut in this Budget. Even more promisingly for us is the growth potential from education, training and the Green Investment bank. Our constituency is a leading example of apprenticeships from Clark Door in Carlisle, training high quality apprentice engineers, through to Innovia in Wigton to the butchery apprentices that I met at Cranstons last month. This Budget allows for 40,000 additional apprentices and 100,000 additional work places. The Green Investment Bank will allow the government to invest £3 billion into the economy. This will not only support projects such as the Bongate Hydro in Appleby and its piloting of ground-breaking SMEC technology, but will also provide much needed credit and demand as we come out of a difficult economic cycle. These are difficult times; the Chancellor has taken a very cautious approach to public finances and rightly did not try to put too many headline giveaways into the Budget. It is a cautious and responsible start to the recovery. But its focus on small businesses and its understanding of rural areas makes it a great Budget for Penrith and the Border. 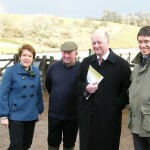 Rory welcomed to Cumbria Secretary of State The Rt Hon Caroline Spelman MP and Minister of State for Agriculture and Food Jim Paice MP on Thursday March 10th in a day-long visit to Penrith and the Border. Rory took Caroline Spelman and Jim Paice first to uplands hill farm Gaythorn Hall near Orton, where tenant farm-manager Stephen Lord welcomed the Ministers to breakfast in his farmhouse and discussed a range of issues affecting uplands farmers and farming communities. 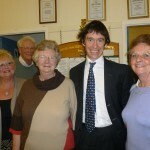 Rory then guided the Ministers on a morning tour of the Big Society vanguard, taking them to Crosby Ravensworth to meet parishioners involved in the affordable housing scheme and the community buy-out of the Butcher’s Arms pub; to Great Asby to meet with residents using the community-run Great Asby Broadband service; and to the Eden River at Bongate in Appleby, where they met with members of the Heart of Eden community plan, Appleby Town Council and representatives of the Environment Agency and Natural England to discuss the study being undertaken into the feasibility of a new micro-hydro project that will use pioneering SMEC technology. 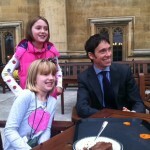 Rory has written to over sixty primary schools in his constituency to encourage them to enter the 2011 Make IT Happy competition, the theme of which is ‘Pass IT On’. This year schools across Britain are being challenged to demonstrate how they have used technology to connect schoolchildren with others in their community – whether down the corridor, across the street or around the UK. Twelve winning schools from across the UK will be awarded £1,200 each, and from these entries 3 overall winners will be chosen to receive additional cash prizes. 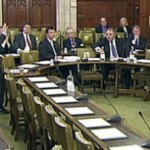 All winners will be invited to attend an awards ceremony on 28th June 2011 at the Houses of Parliament. This year’s entry deadline is April 10th. Make IT Happy is organised by the Parliamentary Information Technology Committee (PITCOM) in partnership with e-skills UK (the sector skills council for Business and Information Technology) and is supported by the Institution of Engineering and Technology (IET) and the Nominet Trust. Rory visited Penrith’s Eden Rural Foyer on Saturday 19th March, where he was given a tour of the Foyer, met with current residents and presented certificates as part of the Foyer’s award-winning healthcare programme. 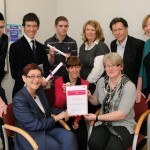 He joined Chief Executive of the Foyer Federation Jane Slowey, and Chief Executive of Impact housing Association Mike Muir in a ceremony that recognised Penrith’s winning of the Full Transformational Innovation Mark Award from the Foyer Federation – the only Foyer in the country to have received the full award in recognition of its work with young people. This is not something that began in Libya, and it will not end in Libya. It came out of a regional situation. It is a response primarily to Egypt and Tunisia. We should be celebrating, but with immense caution, what both the Prime Minister and the Leader of the Opposition have supported because of that broader regional context. We are talking about not one country and one month, but a series of countries and 30 years. We have to keep our eyes on that, or we will find ourselves in a very dangerous and difficult situation. The situation in Libya and the no-fly zone are driven, of course, as everybody in the House has said, by our humanitarian obligation to the Libyan people. It is driven by our concerns for national security and, probably most of all—this is not something that we should minimise—by the kind of message that we are trying to pass to people in Egypt or Tunisia. If we had stood back at this moment and done nothing—if we had allowed Gaddafi simply to hammer Benghazi—people in Egypt, Tunisia and Syria would have concluded that we were on the side of oil-rich regimes against their people. We would have no progressive narrative with which we could engage with that region over the next three decades. Stephen Lloyd (Eastbourne) (LD) : On that point, does my hon. Friend agree that it is incredibly significant that both the Arab League and countries in the area such as Qatar support the engagement and the UN resolution? 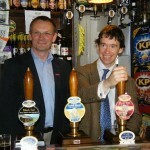 Rory Stewart: I agree very strongly. That is immensely significant, but the meaning of that needs to be clear. The limits that the Prime Minister has set are so important to all of us exactly because of that point. The reason we need the Arab League and the UN on side, the reason we need a limited resolution, and the reason all the comments from around the House warning that the situation should not become another Iraq are so important is that we are talking about 30 years, not just the next few months. Respectfully, I disagree with the right hon. and learned Member for North East Fife (Sir Menzies Campbell); the most important thing for us now is to be careful with our language and rhetoric, and careful about the kinds of expectations that we raise. I would respectfully say that phrases such as “This is necessary,” or even “This is legitimate,” are dangerous. All the things that the Prime Minister and the Leader of the Opposition have done to hedge us in, limit us, and say, “This isn’t going to be an occupation” are fantastic, but they are only the beginning. Katy Clark (North Ayrshire and Arran) (Lab) : Does the hon. Gentleman agree that one of the risks is that it might be said on the Arab street that we would not be interested if it were not for the oil in Libya? 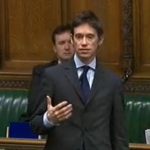 Rory Stewart: That is a very important danger. The fact that Libya is not just an Arab country, but a country with oil, has to be borne in mind. The kind of legitimacy that we may have had in Kosovo will be more difficult to come by in Libya for that reason. The biggest dangers—the dangers that we take away from Afghanistan—are threefold. The Prime Minister will have to stick hard to his commitment, because it is easy for us to say today, “So far and no further,” but all the lessons of Afghanistan are that if we dip our toes in, we are very soon up to our neck. That is because of the structure of that kind of rhetoric, and the ways in which we develop four kinds of fear, two kinds of moral obligation, and an entire institutional pressure behind reinvestment. 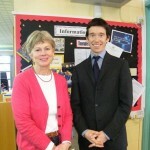 That is why the former Secretary of State for Defence, the right hon. Member for Coventry North East (Mr Ainsworth), is correct to sound his cautions. That is the fear of the rogue state. The second fear is the fear of the failed state. Gaddafi is making that argument himself: “If I collapse, al-Qaeda will come roaring into Libya.” The third fear that people are beginning to express is a fear of neighbours. They are already beginning to say, “If this collapses, refugees will pour across the borders into other countries.” The fourth fear is fear for ourselves: fear for our credibility, and fear that we might look ridiculous if, in response to our imprecations or threats, Gaddafi remains. We have seen the same fears in Vietnam, where people talked about the domino theory. We have seen the same fears in Iraq when people talked about weapons of mass destruction. We have seen the same fears in Afghanistan, where people worried that, if Afghanistan were to topple, Pakistan would topple and mad mullahs would get their hands on nuclear weapons. Those are all the same fears, and the same sense of moral obligation. We do not need to be able to name two cities in Libya to be able to talk about two kinds of moral obligation: our moral obligation to the Libyan people, and our moral obligation because we sold arms to the Libyans in the past. This is very dangerous, and we must get away from that kind of language and into the kind of language that is humble, that accepts our limits, and allows us to accept that we have a moral obligation to the Libyan people but that it is a limited one because we have a moral obligation to many other people in the world, particularly to our own people in this country. Of course we have a national security interest in Libya, but we have such an interest in 40 or 50 countries around the world, and we must match our resources to our priorities. The real lesson from all these conflicts is not, as we imagine, that we must act. The real lesson is not just our failure, but our failure to acknowledge our failure, and our desire to dig ever deeper. It is our inability to acknowledge that, in the middle east, many people will put a very sinister interpretation on our actions. It is also our failure to acknowledge that “ought” implies “can”. We do not have a moral obligation to do what we cannot do. We have to consider our resources rather than our desires. What does that mean? This is easy for someone on the Back Bench to say, and much more difficult for a Prime Minister or other leader to say. How do we set a passionately moderate rhetoric? How do we speak to people to support something that is important? How do we acknowledge the moral obligation and the national security questions, but set the limits so that we do not get in too deep? I suggest that we need to state this in the most realistic, limited terms. First, we need to say that our objective is primarily humanitarian: it is to decrease the likelihood of massacre, ethnic cleansing and civil war, and to increase the likelihood of a peaceful political settlement. Secondly, we will try, in so far as it is within our power to do so, to contain and manage any threat from Libya. Finally, we will deliver development and humanitarian assistance. In the end, however, the real message that we are passing on through limited rhetoric is not to the people of Britain but to the people of the middle east over the next 30 years. Rory has issued a statement in relation to the ongoing consultation at High Hesket and Armathwaite primary schools, and will attempt to broker a better level of communication between parents, teachers and local authority representatives. Until yesterday, I thought we were at the end of the age of intervention. The complacency that followed the collapse of the Soviet Union had been shattered by the Balkan wars; despair was followed by the successful interventions in Bosnia and then Kosovo; then triumphal pride led us to disaster in Iraq and Afghanistan. Midway through the period, in 2000, it seemed we could intervene anywhere. By 2010, it felt as though we would not venture abroad again. What had begun with the irresistible victory of democracy, the free market and the United States, ended with occupation, financial crisis and American impotence. It seemed doubly unlikely that we would ever intervene in a country like Libya. Even oil-less, Central Asian Afghanistan was perceived by many Muslims as the object of a crusading infidel occupation, driven by Israel and designed to establish bases or extract cheaper oil. Any move against Libya – an Arab, Muslim country, obsessed with its struggle against colonialism and dripping with oil – seemed bound to be perceived in the most hostile and sinister terms by its neighbours, by the developing world and by the Libyans themselves. Nor did Libya appear to meet the criteria for intervention under international law. Gaddafi was the sovereign power, not the rebels, and he was not conducting genocide or ethnic cleansing. In Bosnia, by contrast, 100,000 people had died in a few weeks; and it was Bosnia itself – a sovereign, UN-recognised state – which formally requested the intervention. Kosovo was a less clear case, but the intervention targeted Milosevic, and followed the Balkan wars, which he had stoked, and the displacement of 200,000 people and clear evidence of ethnically-targeted atrocities. This interventionist worldview, which might have seemed in 1999 the quintessence of global governance and consensus, had, however, begun to seem a fading Western obsession. By 2011 Brazil, India and South Africa, as well as China, were on the Security Council. And none of them supported intervention. So I argued on Thursday in the House of Commons that while we had a moral right to protect Libyans from Gaddafi, it would be wrong to act without a full UN Security Council resolution. Britain should use its support of the no-fly zone to give a clear signal of its opposition to Gaddafi and its support for progress in the Middle East. At the time it seemed that a Russian veto would ensure that this would not actually be backed by fighter jets. But Russia didn’t veto the resolution. And, as of last night, 17 March, the French, British and Americans are cleared to intervene in the Middle East ‘with all necessary measures’. The planes are moving into position. The foreign ministers of minor Arab states are taking calls on their cell-phones from Western politicians. 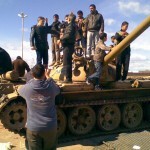 Twitter accounts explode around the Libyan hash-tag. And I imagine that in small executive offices, lit by giant television screens, generals, special advisers, diplomats, press handlers and politicians are trying to work out what to do. Gaddafi’s initial response has been nimble. Within half an hour of the resolution his spokesman was parroting UN English: ‘the technical aspects of the ceasefire’, ‘some concerns over the text’. He used a translator to turn his English back into Arabic – perhaps his audience was in the Gulf and he wanted to use only the most formal Arabic. But the translator, who was more confident with standard authoritarian phrases about ‘the peaceful intention of the Libyan national security forces’, struggled with the UN jargon and had to be corrected by his boss. On Friday morning, the Libyan foreign minister found his stride and his new persona as a constructive and neutral participant. He spoke in Arabic, talking so deferentially of the ‘Majlis al-Aman’ (‘the Security Assembly’) that it took me a moment to realise he was referring to the UN Security Council, not to some security apparatus of Gaddafi’s. How about our response? If the crises of Bosnia, Kosovo, Iraq and Afghanistan, which have consumed more than 100,000 lives, four trillion dollars and absorbed a million foreign soldiers from 60 countries, have not made us more prudent, they should at least have made us wiser. For two decades our policies in these countries have been described, explained and criticised by political philosophers, civil servants, human rights activists, journalists, development workers, film-makers and 10,000 consultants. Parliamentarians round the world refer confidently to ‘Chapter 7 resolutions’, ‘no-fly zones’, ‘the experience of the Kurds’ and ‘the responsibility to protect’. But the basic questions about intervention seem to remain as obvious as they are unhelpful. You do not need to be able to name four cities in Libya to have four arguments against or for what we are doing. You can simply deploy those which were used in 1960s Vietnam, 1920s Syria and 1860s Afghanistan. Against these stand the four national security arguments for intervention: fear of a rogue state, fear of a failed state, fear for the neighbours and fear for ourselves. First, we called Iraq a rogue state – the weapons of mass destruction, which could be launched within 45 minutes. Second, we called Afghanistan in 2002 a failed state – the vacuum filled by drug-dealers and terrorists. Third, in 2009, we emphasised the fear for Afghanistan’s neighbour Pakistan: ‘If Afghanistan falls, Pakistan will fall and mad mullahs will get their hands on nuclear weapons in Pakistan.’ (In Vietnam, this was called ‘the domino theory’.) Fourth, we are fearful for our reputation. From Kissinger in Vietnam to the British in Afghanistan there is the eternal anxiety about being seen to be defeated, of giving confidence to enemies, of losing credibility. In Libya’s case, these arguments focus on fear of Gaddafi; fear of al-Qaida in a post-Gaddafi failed state; fear of instability in the region (civil war in Libya shaking North Africa and pushing refugees across the Mediterranean into Europe); and fear for our own credibility (what if he survives our threats and imprecations?). Then there are the moral arguments. There are the arguments against from international law (‘it is in contravention of state sovereignty’) and arguments from guilt (‘we are the people who armed and supported Gaddafi in the first place’). There are the arguments in favour based on the scale – brought home in continual news footage – of human suffering, which make the point that inaction is leading to more deaths: that we have a right and a duty to prevent the killing, a moral obligation to the Libyan people. Thus, three arguments against action. Four fears about inaction. And a background of guilt, law and moral obligation. Each position has its own historical analogy. If you oppose intervention, you call it ‘another Vietnam’. If you support intervention on national security grounds, you call the opponents appeasers and invoke Munich. And you could still do a ‘replace all’ and instead of Libya insert Zimbabwe, Darfur or for that matter Abyssinia, the Hejaz or ‘the Kingdom of Caubul and its dependencies’. Here more than ever what seems to matter is not detailed knowledge of the country concerned but a basic attitude of mind: a high optimism, a reactionary pessimism and very rarely anything in between. This is not to say that the millions of pages produced over the last two decades have achieved nothing. The arguments have been given a makeover and presented in a more contemporary design, encrusted with sparkling statistics, buttressed with new analogies. If you want, you can now replace Vietnam with Iraq, Munich with Rwanda and the Second World War with Bosnia. The ‘forward policy’ is now called ‘state-building’ and ‘pacification’ is ‘counter-insurgency’. But the basic positions remain black and white. Do it or don’t do it, but no halfway houses. And therein lies the danger. On the World Service this afternoon, I was accused of falling between two stools. ‘On the one hand, you say the no-fly zone is humanitarian and not about regime change. On the other hand, you say that we are taking measures against the Gaddafi regime to force him to step down.’ And when I tried to make a distinction between military measures with a humanitarian purpose and civilian measures with a political purpose, the interviewer countered: ‘Surely this is the worst of all worlds.’ On the contrary, it seems to me the lesser evil. The no-fly zone is preferable to seeming to countenance and endorse Gaddafi’s actions; and better than putting troops on the ground to force regime change. But such measures are difficult to explain and sell. Perhaps I am simply traumatised by the failure to stop more troop deployments to Afghanistan. Perhaps this time I should welcome the decision rather than offer grudging support and grim cautions. After all, the UN resolution is clearly opposed to occupation. The West is bruised, feels impoverished and its military is overstretched. Its new leaders have so far proved able to circumvent or answer the irrepressible optimism and bleak warnings of the hawks in their administrations. Obama has successfully fought off the pressure to send any more troops to Afghanistan and Cameron has set an unconditional deadline of 2015 for the end of combat operations there. Both have relied on relatively cautious language. It can, therefore, seem improbable that we would allow ourselves to be dragged deeper. By contrast the rhetoric and the logic in favour of doing more felt hypnotising and irrepressible. Yet the arguments used in Afghanistan are already being applied to Libya. All those concerns about Gaddafi and stability can be quickly translated into the ‘existential threat to global security’ and into those four fears, which lead to talk of failure not being an option. They mean that, as an American general recently told me in Afghanistan, ‘Plan B is more of Plan A.’ When we speak of having an obligation (in this case a moral obligation towards the Libyan people) or a ‘duty to intervene’ we tend to imagine it as an almost unconditional obligation. The complex logic, statistics and theories which drove the surge in Afghanistan remain immensely appealing. The same people will soon be working on Libya. And if they find that the no-fly zone is not having the effect they wanted: not toppling the regime, not eliminating human rights abuses, not fostering international security, they will press for more. We need therefore to work out how best to use the no-fly zone, while recognising how insecure and reckless we can be tempted to be. I had imagined the time had come to remind people that, despite Afghanistan, we can still play a constructive international role. But today, though I am in favour of the no-fly zone, it seems as though the real danger remains not despair but our irrepressible, almost hyperactive actions: that sense of moral obligation; those fears about rogue states, failed states, regions and our own credibility, which threaten to make this decade again a decade of over-intervention. It is two in the morning. The House of Commons debate today was on Libya and the UN resolution passed three hours ago. There is talk of planes flying tonight. On the radio, Gaddafi’s spokesman rattles off UN jargon in English: ‘the technical aspects of the cease-fire’, ‘some concerns over the text’. The spokesman – who is an Arab himself – uses a translator to turn his English into Arabic. Perhaps his audience is in the Gulf and he wants to use only the most formal speech. But the translator, confident with the normal totalitarian phrases like ‘the peaceful intention of the national security forces’, struggles with the UN jargon and has to be corrected by his boss. Gaddafi is presenting himself as a neutral participant, engaging with a UN process – when he is in fact the target of a resolution, from people who want to depose him. After ten minutes of this the BBC commentator sounds more than a little confused. So am I.
I will be in home this coming morning visiting Plumpton School, an uplands meeting and a flood protection scheme at Eamont Bridge, so I will miss the Prime-Minister’s statements in the House. But the whole day’s debate was on Libya, and Parliament struggled – as it did with Bosnia, with Kosovo, with Iraq and Afghanistan to find the words and arguments to apply to modern war. Nicholas Soames, Churchill’s grandson made the most formal and polished speech on the future of the Middle East. Jeremy Corbyn, the Labour MP from Islington, focused on arms sales. Some members were unable to resist focusing almost entirely on Israel-Palestine. The shadows of previous conflicts were present – but barely mentioned. There was an element of pantomime in the debate – most people, I think, assumed that the Russians would never approve a no-fly zone in Libya, so all the talk of intervention was almost make-believe. It is suddenly no longer. The Russians didn’t veto and it is now our job to make this no-fly zone work. But all this is still largely symbolic. A no-fly zone on its own will not topple Gaddafi: it may not even stop him from taking the rebel cities. Gaddafi might still be in power in three years’ time: still threaten his own people, and us. I tried to use my speech to argue that despite all the risk and threat, we need an optimistic long-term vision for the Middle East. Rather than getting caught up in exactly what is happening hour by hour in Libya, we must remember what the region will mean to us in twenty years’ time. It is not just that they are on the other side of the Mediterranean. It is not just that they have an incredible young, unemployed population who are both a potential source of prosperity for their own nations and for us and a potential threat to us. It is that we have much greater leverage there than on nations much further away, such as Afghanistan. The relationships between France and Morocco and between Italy and Libya—indeed, around the whole Mediterranean littoral—are so close. These countries in demographic, energy, religious and security terms will prove to be far more important than we have acknowledged. What we are hearing in Egypt and Tunisia is not some accidental, sporadic event that will be constrained by inevitable forces of tyranny or Arabic culture. I believe the Middle East is moving decisively in a more democratic direction: like central and eastern Europe and Latin America over the past 20 years. And, it is in our political and moral interests for this to happen. This is Britain’s opportunity and Europe’s moment, and we need to be clear about this. But not starry-eyed. The language on the streets in the Middle East today is very different from that of Eastern Europe. George W Bush has done a great disservice to words such as liberty, equality and democracy—words that were on the lips of Vaclav Havel—which do not sound so comfortable when we talk to those countries. We need new words. We need a whole new language and it needs to be driven by them, not us. Freedom is not something that is given but something that is taken. But we can, nevertheless, have a constructive role over the next 20 to 30 years in helping the Middle East and North Africa be more stable, more prosperous and more humane. That is our mission. That is what we have to put our weight behind and is where we need to invest. The truth is important but difficult to communicate to politicians, journalists, and voters. Things can be done. More than we fear. But never in the Middle East, through military occupation. Our example should be Eastern Europe, not Iraq. Almost all the running has to be made by local people. We are only in support. But there are economic structures we can bring, and access to our markets; advice; moments where our diplomats and their human relationships can transform events. It will be bewildering, frustrating. But it is the central international task of our generation, and it will require patience and passionate moderation.